While we grow many varieties of grapes, the major ones are listed here with a description. Very vigorous variety with good disease resistance. Slightly upright in growth habit. Produces a very fruity white wine with pineapple, apricot and peach in the nose. This Swenson selection is grown from Nebraska to New England, but in limited quantities at the moment. Selected by Elmer Swenson. This cross of Seyval and Chardonnay produces an excellent wine when mature fruit is used. Good locations with large growing seasons are required to ripen the fruit. This variety is a bit tender for our location, but makes an excellent wine so we have opted to continue growing this one. Some years there may be some dieback and subsequent decrease in yield, but we feel the flavor of the wine is worth the risk. White wine. Hardy to -36 F. Requires a careful spray program to control black rot and downy mildew. Moderate vigor. Sugar can develop to 22-27 brix with high acid. Wine can be excellent in a semi sweet or dessert style. Similar to a good Vignole or Riesling, with apricot, citrus and honey in the nose and flavor. Ripens mid-season. Selected by the University of Minnesota. White wine. Hardy to -25 F. Vigor and disease resistance are moderate. Sugar content of 19-21 brix. Good varietal wines have been made in a dry and semi-dry style and are clean, fruity, with good acidity similar to Seyval, one of its parents. Citrus, apple, pear and melon have been noted in the nose. Also does well when lightly oaked or barrel fermented. This is one of the leading white wine varieties in some upper Mid-Western states and does very well in the moderate sites of the Northeast. Ripens late season. Selected by Elmer Swenson. A white wine grape with muscat flavors and a nice floral nose. Nice sized clusters, slow vigor with good winter hardiness. Bred by David McGregor. White wine. A sister seedling of LaCrosse but hardier, to around -26 F. This variety is pistallite, meaning that it has only female flowers and must be planted near other varieites to ensure proper fruit set. It should be pruned to a high bud count to make sure there is adequate fruit production. Small berries are formed on medium loose clusters. Ripens mid season to about 20 brix and 1.0% total acidity. Two rows of St. Pepin next to one row of another variety like Frontenac gris, LaCrosse or others will do well. Excellent wines have been made from St. Pepin as a varietal and also in a blend. 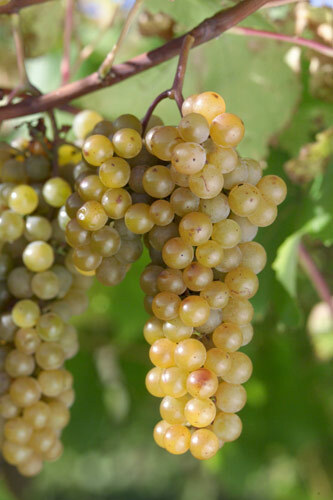 When well ripened, fruit quality is similar to Reisling. Suitable for ice wine production. Selected by Elmer Swenson. Bears a full crop after-35 F. This is a very vigorous vine with fair resistance to powdery mildew and is immune to downy mildew. Arching in growth. Wine quality can be very good, garnet in color with an intense cherry, plum, and sometimes chocolate aroma. Ripens late in the season with 25 brix or higher. Requires ample heat to reduce its typically high acid. Frontenac has proven itself very versatile in the winery. Besides medium bodied reds, commercially produced roses, some blended with Frontenac gris for more complexity, with some residual sugar to balance the acid, have become very popular. It is also being made into award winning Port wine. Most widely planted wine grape in Minnesota. Selected by the University of Minnesota. A sister seedling of Foch. Hardy to -15F to -20F. Ripens earlier than Foch to good sugar/acid balance. Very nice body in fully ripened fruit. Excellent wines have been made in several different styles from light blends to full bodied, dry reds. Blends well with higher acid varieties. Selected by Kuhlman. Petite Pearl (formerly TP 2-1-24) is a new red wine variety bred by the esteemed Minnesota viticulturist and author, Tom Plocher. While this variety has only been planted in experimental quantities since it was bred and evaluation began in 1996, it has shown exceptional resistance to fungal diseases and bunch rots. Vigor is moderate, with an open, trailing growth habit. Fruit ripens mid to late season to around 24 brix and less than 1%TA. It has consistently produced a crop in the St. Paul area after -32F. Early wines are very complex, with lots of spice, jammy fruit and nice, round tannins in the middle mouth and finish. This may be an excellent blending component to add complexity and softness to most northern reds. Hardy to -32 F or better. Good resistance to powdery mildew and black rot. Susceptible to downy mildew. A very reliable grape in the Northeast and Mid-West. Many excellent wines have been made from St. Croix. Vinifera-like, with good fruit and low tannin. Wine characteristics include a strong berry nose with lesser notes of cedar, tobacco and spice. An excellent lower acid and lower sugar blending agent for other high sugar varieties, like Marquette and Frontenac. Achieves 18-20 brix with moderate acidity. Ripens mid season. Also makes a suitable seeded table grape. Selected by Elmer Swenson. More winter hardy than most seedless grapes. 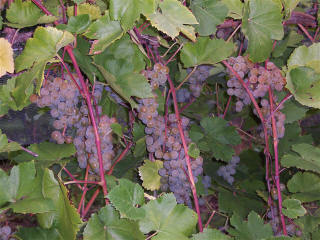 Produces medium clusters with small, sweet, red berries similar to those of Delaware. A vigorous, blue seedless grape. Clusters are medium sized and well filled. Hardiness has been good at Geneva, New York, and the vines are resistant to several major diseases. Vines may bear fruit precociously, and production should be controlled on young vines to prevent delays in establishment. Produces large clusters of round, red, medium-sized berries. The skins are tender and the flesh is melting in texture, with a sweet flavor. Coloring may be poor in some years, but cold hardiness is among the highest of the seedless varieties. University of Arkansas Ontario/Suffolk Red cross.